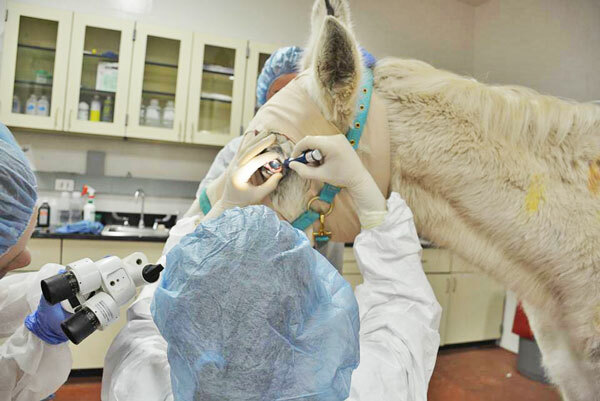 Advances in equine surgical techniques in recent years has resulted in a growing trend toward operations on standing horses, resulting in fewer complications and a reduction in the hazards of anaesthesia. Equine veterinarian Dr Bruce Bladon, principal surgeon at the Donnington Grove Veterinary Surgery, said there was a growing trend towards surgery in the standing horse over general anaesthesia, pointing out that the use of the latter comes with an increased risk of complications that could lead to higher mortality rates. “The overarching change in recent years has definitely been in relation to surgery in the standing horse,” Bladon said. “This is ironic, because we’ve seen considerable developments in the field of general anaesthesia along with improved recovery from anaesthesia, which means it’s much less dangerous for a horse to undergo anaesthesia nowadays. “Despite these advances, I’ve witnessed cases where surgery under general anaesthesia is both dangerous and unnecessary, for example, in the surgical treatment of splint bone fractures. The other key area where surgery is associated with complications during recovery from anaesthetic is fracture repair. These sort of complications can now be avoided thanks to our ability to perform surgery in the standing sedated horse,” he said. Bladon refers to earlier research, which revealed a 1% mortality rate for horses undergoing routine surgery. However, with significant advances in veterinary science and from looking at results within his own clinic, Bladon suggests that all surgical practices should be aspiring to a mortality rate of one in a thousand rather than one in a hundred. “Equine surgery can be very complex. But as veterinarians, we care about our patients and we aim to select surgical methods based on what will give a horse the best outcome. “Fracture repair in the standing sedated horse was originally adopted in Australia. We’ve been using techniques for standing fracture repair in my clinic for some time now with excellent results. In fact, we’ve never achieved comparable results with other ways of repairing these fractures,” he said. Bladon, who is Emergency Services Team Leader at the Rio 2016 Olympics, also highlighted other areas of surgery which are now routinely undertaken in the standing horse, including laparoscopy. Bladon explained that this technique is not necessarily replacing surgery under general anaesthesia; rather, it’s opening up a new field of surgical procedures which simply could not be performed before. Dr Bruce Bladon is one of the keynote speakers at this year’s Equine Veterinarians Australia Bain Fallon Conference, in Melbourne from July 17 to 21.